The Danish automotive company, at the 2018 Geneva Motor Show, has featured their latest variant named Zenvo TSR-S. This car is said to be powered by more than 1,000 horsepower and is a street version of the previous variant of track-only TSR. This supercar is built on a basic TS1 platform, which uses a twin-supercharged 5.8 liter V8 engine that can spew the power up to 1,177 horsepower, which allows the car to accelerate from rest to 100 kph in just 2.8 seconds, 0-200 kph in 6.8 seconds and has a speed that has been electronically limited to 325 kph. The recipe for the construction of these car may sound simple, because it uses mild steel and semi-monocoque aluminum with sub-frame front and rear steel and carbon fiber body, but the Rear-Wheels Drive (RWD) hypercar from the Danish manufacturer is a very complicated monster, because the company claims that TSR- S is very very similar to a race car. For example, the machine which has three settings: Minimum which only provides 700 hp, Maximum which emits all the power that has 1,177 hp, and IQ. The latter is an autonomous and "smart" arrangement intended to provide a sense of racing cars while drive the car on the streets, thanks to traction controls that continuously measure the tire grips and adjust power, so that the ideal amount of power can be transmitted properly to the rear wheels. Then there is a 7-speed dual-clutch transmission that has helical-cut dog gear and two completely different setups. In Road mode, the gear replacement is done electronically so that it can run smoothly. In Race mode, the gear replacement is purely mechanical for a brutal feel like a racing car. 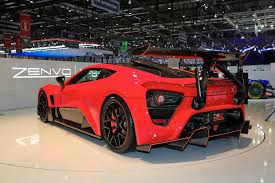 Zenvo is very proud of their revolutionary Centripetal Wing. That's because the wing can rotate between two axes so that it can function like an air brake when lifted in a horizontal position, and the stabilizer when cornering, where it rotates following the longitudinal axis of the hypercar, provides additional grip and stability. In addition, the high position makes it behave like an extra anti-roll bar, improving rear wheel stability. This is a new trend of active aerodynamics which in the future may begin to be applied to performance cars with different techniques, but with the same concept. 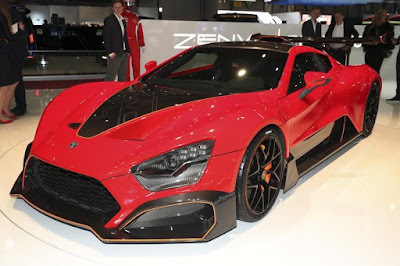 It has been 9 years since the appearance of Zenvo ST1, and the appearance of Zenvo TSR-S is positioned between the TS1 GT variant and the TSR model that was present before. Overall design of the Zenvo TSR-S is still influenced by the previous model, only with more extreme aerokit. On the other hand, the interior clearly presents a racing car theme. So there is no sound system, sat nav, air conditioning or even airbags and carbon seats are also operated manually. Almost every surface on this car is made with carbon fiber, but Alcantara is still used only to reduce the reflection of the windshield. New digital instrument display with horizontal rpm display that reminds us of the 1980s racing cars, then the gear selection indicators, according to Zenvo, the driver needs to know while driving the car in very fast speed.